I know in Russia people are getting ready to celebrate May holidays, but I didn't remember the significance of all the days. So, I googled it and found this interesting image. In the U.S., we don't celebrate International Workers' Day on 1 May. We have a similar holiday called "Labor Day," which is celebrated on the first Monday of September. It's a national holiday, and officially marks the end of summertime. I understand that in modern day Russia the holiday has lost some significance, and it is mainly a day of protest. Should I continue to publish reports this week, or will everyone be away from LiveJournal? How will you spend the holidays? Unfortunately, I no longer have my flight benefits through United Airlines, so my overseas travel this summer will now be much less. Soon, I'll put up a poll and readers can vote on my next U.S. destination. You will recall I did this last year, and readers sent me to Wyoming. I'm thinking of Colorado, Montana, or maybe somewhere in Canada. I wish everyone a relaxing holiday, whether you spend it traveling or with family! It's the closest American holiday for comparison purposes. We have crazy grandmas here also. :)) I think babushkas are either really sweet, or very, very scary and mean!! 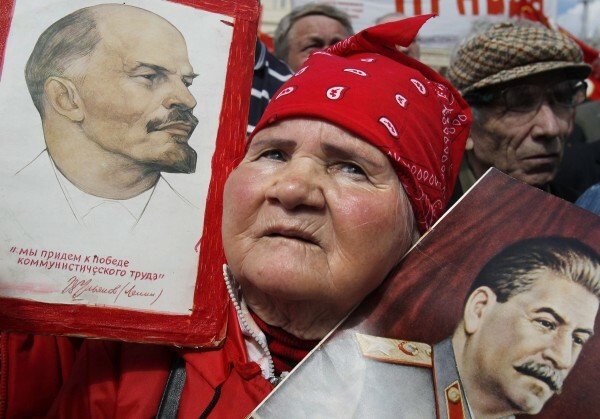 Nowadays virtually nobody in Russia thinks of 1 May as `Workers's Day`. However, as it's close to 9 May — Victory Day, — these holdiays togeter are often referred to as `May holidays` and play the role of extra long holidays, like the Christmas ones. Just a free day off of work then? Great to have so many days off in a row. In America, we don't really have this. Holidays are usually on Mondays, so we get long three day weekends. Well, at present I dare say it has completely lost any significance. I bet most of the schoolchildren will hesitate to explain what it is all about (at least, mine failed). There is no official or traditional pattern for celebration, so it has lost its meaning. I suspect that even our government doesn't have any idea, what is this holiday about now. But it traditionally means 3-4 days off, and combined with Victory day (9th of May) it makes a week or more of general idling. Those who have money, go abroad (so all destinations are at least 1, 5 times more expensive for this period), those who don't - devote their free time to children, relatives, or gardening. In many regions of Russia it is the beginning of gardening season, so people go to their 'dachas' (I suppose you are already familiar with this part of our culture?) and begin digging, mending, cleaning or planting. As for our family, we will use this 4-days holiday to visit my husband's parents who live in 700 km from us, and so will do his brother with his family, so it will be an enormous family gathering (10 people in total, including 4 children). Sure, I know all about dachas but have never visited one. :( Pity! We have our own dacha type place where my family gathers on most summer weekends. Well, dacha American style. :) I wrote a post about it - http://peacetraveler22.livejournal.com/24617.html. Enjoy the time with your family! No holiday on May 1st, even though the actual event that was originally commemorated on that day happened in Chicago! It is a common day to organize protests and demonstrations. Not just social protests any more. In Moscow there is usually an official trade union demonstration, a communist meeting and some smaller events. This year the nationalists are going to participate though their day is different (the infamous November 4 that the government tries to introduce to replace November 7, the day of Russian revolution in 1917 - they took a chance). But May 9 - the Victory day - is celebrated much wider. Yeah, I read the same Wiki article. :) How will you and Maria celebrate the holidays? Going anywhere? Guam? It has never been on my list of travel destinations. What is interesting there? I am going to go to Kazan tomorrow by car. Have fun! Many people tell me this is a beautiful city. I hate Lenin, Stalin and communism. And I do not celebrate these May holidays. Let god curse it. I doubt most people are actually celebrating the holidays. They simply view them as days off of work. >it is mainly a day of protest. Will you do anything exciting during the break, or just relax? I don't remember for sure, but I think the May 1 tradition originally came from Chicago (it was somehow associated with the first trade unions in the late 19th century). As of your question, I'm in Amsterdam now, and still reading LJ:). Amsterdam is a beautiful city, especially in spring time! Yes, Chicago plays a role in the history of the holiday. In Soviet times there was an official demonstration on Red Square. We also had a parade and a demonstration after it on the 7th of November. But at least we still have the impressive Victory Day parade! At 46:11 mobile strategic missiles run and then aviation. 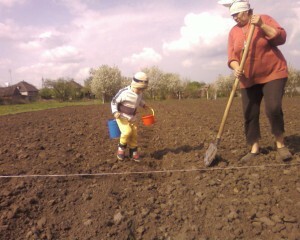 in the countryside we usually wait for these days to work in our gardens. so, as every year, we'll plant, plant, plant as much as we can. Does not sound like a holiday! Planting/gardening hard work. I recently witnessed such chaos at the Israeli border crossings. That was enough excitement to last awhile! You are about to loose the significant part of your fans. Mr. Putin believes the internet prevents russian people from being happy and loyal citizen because it is the weapon of CIA as he suggested. Soon russian internet starts to function the same way as in China and Zhe Zhe will be probable closed. I read his absurd statement that the Internet is entirely controlled by the CIA!! Maybe he's been chatting with fritzmorgen? :)) In the event .RUnet goes down, I'm prepared. You can find me at peacetraveler22.com. I reserved the domain over a year ago.